*T-shirts are not guaranteed for registrations made after April 5th. Register online through April 12th. 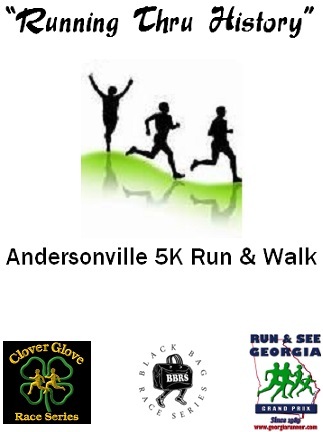 Proceeds to benefit Macon County Recreation, Non-profits, and Friends of Andersonville. All participants registered by April 5th will receive a T-shirt and a Pac Bag filled with goodies. Awards are presented to the top three male and female finishers in each of 16 age groups. For more information please call Regina McDuffie at the Macon County Board of Commissioners at 478-472-7021.